Some 60% of all book buyers shopped at least once a year at Borders--two-thirds were infrequent visitors--and about 60% of former Borders customers "have yet to appreciably increase their shopping at other bookselling locations," according to a preview of the third annual survey conducted by Verso Digital of consumer book-buying behavior. This means, according to Verso's Jack McKeown, that "an ongoing battle for market share among these customers" will continue into 2012 and beyond that represents both a challenge and an opportunity for independent booksellers. Slightly over a third of former Borders customers are increasing visits to other book retailers, including online book retailers (36.1%), Barnes & Noble and Books-A-Million (27.2%), local independents (23.1%) and big-box retailers (18.3%). 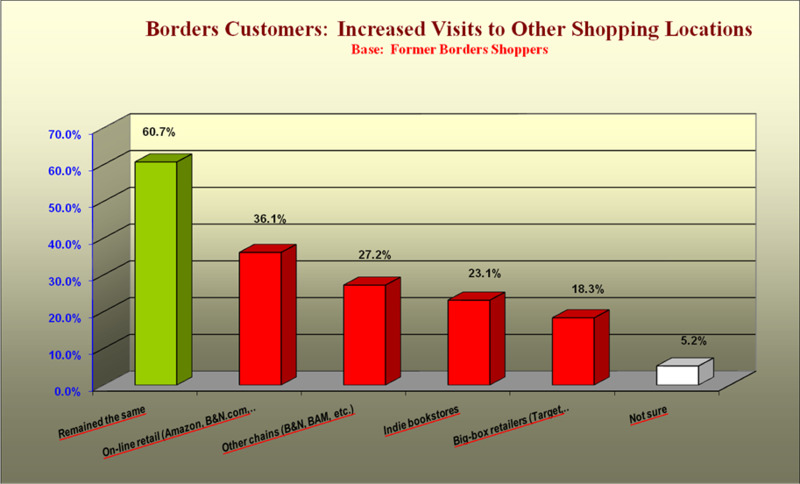 Among other findings from the survey, which will be presented in its entirety by McKeown at the ABA's Winter Institute in New Orleans next week (he will also attend in his role as president of Books & Books Westhampton Beach, Westhampton Beach, N.Y., which opened in 2010), "much of the impact of former Borders customers shopping elsewhere (chains, local indies, online or in big-box retailers) will be experienced around the holidays and other gift-giving occasions," which likely accounts for the holiday sales surge reported by many independents, McKeown said. 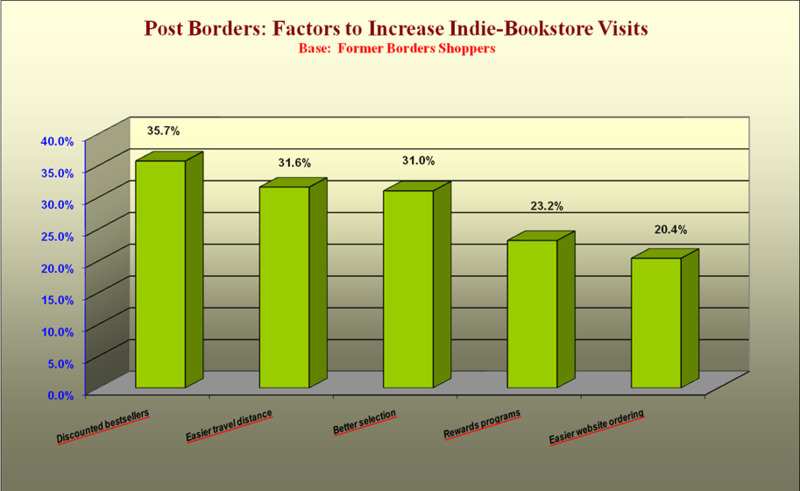 The most important factor attracting former Borders customers to indies are discounted bestsellers (35.7%) and easy travel distance (31.6%). 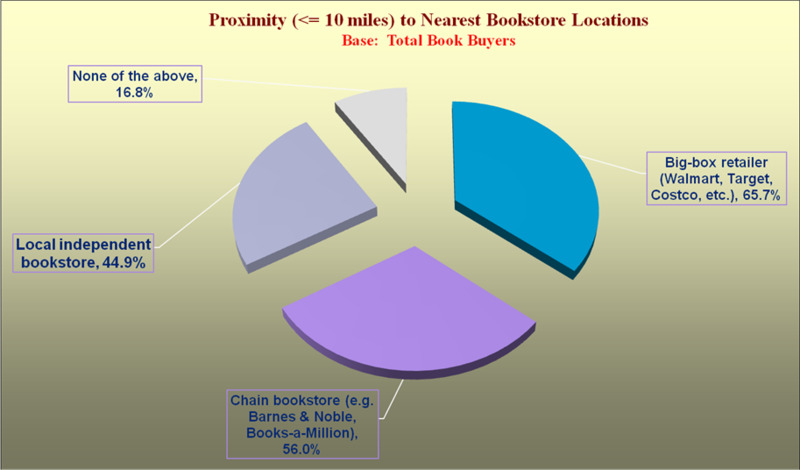 The "proximity" factor is a challenge to indies because some 55% of book buyers live or work farther than 10 miles from the closest independent while 56% live or work within 10 miles of a chain bookstore. The full Verso survey updates some information studied earlier, such as e-book ownership, e-book piracy and the buying patterns of consumers who buy both printed and e-books. The survey also investigates new topics--for example, there will be much more on how readers have changed book buying habits following the closing of Borders last year. The survey of 2,200 book consumers was conducted between November 29 and December 4 and has a 1.5 point margin of error. Barnes & Noble will offer discounts on Nooks--and even give one version away--to customers who also buy one-year subscriptions to Nook editions of People or the New York Times, the Times itself reported today. (No word from People.) The promotion runs through March 9. 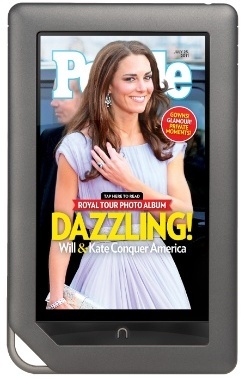 With a year's subscription to People for $9.99 a month, customers can buy a Nook Tablet for $199 rather than its regular price of $249. Customers who buy the Times subscription for $19.99 a month receive the Nook Simple Touch for free or a Nook Color for $99. B&N indicated last week that during the holidays, sales of its tablets have been strong but that sales of black-and-white Nooks had been disappointing. Blind Dog Books has opened in the beach community of Seabrook, Wash. The store is a general-interest bookstore featuring "local history and activities, mysteries, best sellers and books you like to read on rainy days at the beach," according to owner Patty Whitney. It also offers gifts and jewelry and is on the main floor of a townhouse. The store may be reached at Blind Dog Books, P.O. Box 432, Pacific Beach, Wash. 98571; 206-920-0559; patty@blinddogbookswa.com. Briggs Carriage Bookstore, Brandon, Vt., has closed. 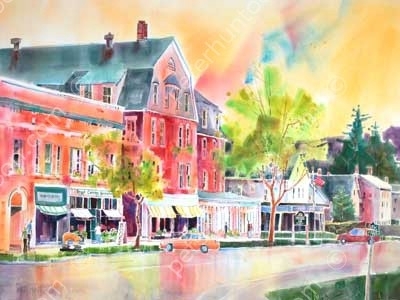 The store was founded in 1997 by Barbara Ebling and Matthew Gibbs and moved in 2003 to a 6,000-sq.-ft. space that included the Ball and Chain Café. 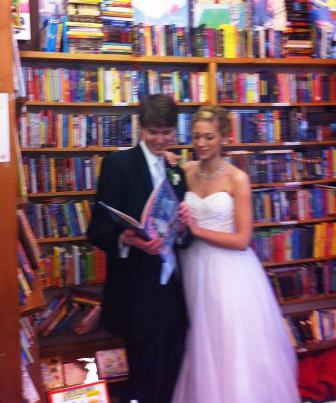 Married in a local church on New Year's Eve, Alyssa and Greg Harvey Hudson stopped by Liberty Bay Books, Poulsbo, Wash., where the bride had worked during college, for a series of photographs. "The beautiful wedding party stopped traffic," owner Suzanne Droppert said. In the store, one young girl who was looking at books looked up at Alyssa and said, "A princess!" 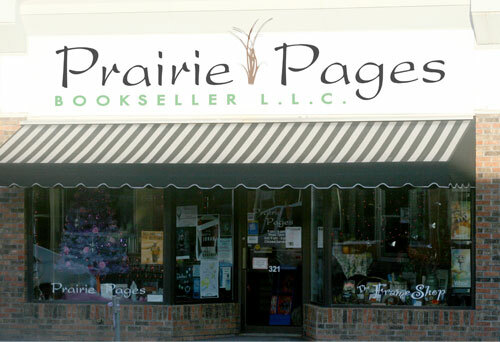 Congratulatoins to Prairie Pages Booksellers, Pierre, S.D., which has been named the South Dakota Retailer of the Year for 2012, the Capital Journal reported. Shawn Lyons, executive director of the South Dakota Retailers Association, praised co-owners Kathy Villa and Peggy Stout, who opened the store in 2006, for their customer service and contribution to the downtown culture, as well as their ability to thrive despite online competition. "They get it," he said. "They understand the importance of customers shopping at home when it's appropriate, and they understand how downtown businesses help each other to succeed." In its profile of Prairie Pages, the Capital Journal wrote that what "most dramatically separates it from a mammoth website or an aisle in a big-box store might be the chance for readers to discuss what they've been perusing--and what they'd like to read next." "People do like sharing their experiences with books," said Villa. 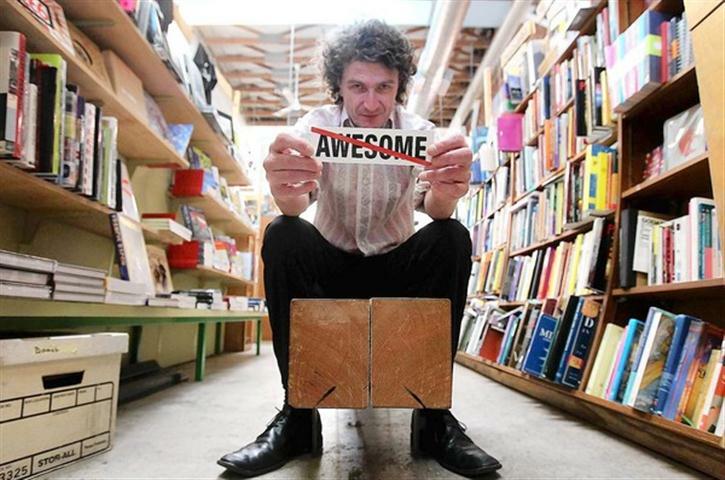 Poet, painter and journalist John Tottenham, who works as a bookseller at Stories Books & Café, Los Angeles, Calif., has launched a Campaign to Stamp Out Awesome (CPSOA), the Los Angeles Times reported. "Saying the word in my presence is like waving a crucifix in a vampire's face. It's boiled down to one catchall superlative that's completely meaningless," said Tottenham, who is trying to turn Stories "into the world's first awesome-free zone. 'Ground zero for a quiet revolution,' Tottenham calls the cafe and shop... The group's manifesto is posted at the counter, and no-awesome stickers with the usual diagonal slash are on sale, with T-shirts to follow," the Times wrote. "It's a matter of semantic satiation," Tottenham observed. "Sometimes I'm sitting in a crowd and I hold my breath until someone says it. Seldom do I die of asphyxiation as a result." Watermark Books & Café, Wichita, Kan., and Penguin have created a Penguin Author Series, featuring book events with four Penguin authors that will be ticketed and held at Watermark between now and May. Authors include Deborah Harkness, Stewart O'Nan, T.C. Boyle and Geraldine Brooks. Maureen Donnelly, v-p and director of publicity at Penguin Books, commented: "We've done individual events in the past and have always been pleased with the results. We think this is an excellent opportunity to continue to brand our Penguin imprint as well as highlight an exceptional independent bookseller. I wouldn't be surprised to see the 'author series' adopted by other smart booksellers." The Winter Palace: A Novel of Catherine the Great by Eva Stachniak (Bantam). This morning on the Today Show: Dylan Ratigan, author of Greedy Bastards: How We Can Stop Corporate Communists, Banksters, and Other Vampires from Sucking America Dry (Simon & Schuster, $25, 9781451642223). He will also appear on today MSNBC's Rachel Maddow Show and tomorrow on Late Night with Jimmy Fallon. Also on the Today Show: Jennifer Hudson, author of I Got This: How I Changed My Ways and Lost What Weighed Me Down (Dutton, $25.95, 9780525952770). This morning on NPR's Morning Edition: Ayad Akhtar, author of American Dervish (Little, Brown, $26.99, 9780316204767). Today on MSNBC's Rock Center with Brian Williams: Rick Riordan, author of the Percy Jackson and the Olympians series, the Kane Chronicles and the Heroes of Olympus, who will reveal the title and cover of the newest Kane Chronicles book. Today on NPR's Diane Rehm Show: Thomas Frank, author of Pity the Billionaire: The Hard-Times Swindle and the Unlikely Comeback of the Right (Metropolitan Books, $25, 9780805093698). Today on Access Hollywood: Lisa Niemi Swayze, author of Worth Fighting For: Love, Loss, and Moving Forward (Atria, $24, 9781439196359). Tonight on the Colbert Report: Melissa Harris-Perry, author of Sister Citizen: Shame, Stereotypes, and Black Women in America (Yale University Press, $28, 9780300165418). Tonight on Nightline: Suze Orman, author of The Money Class: How to Stand in Your Truth and Create the Future You Deserve (Spiegel & Grau, $16, 9780812982138). Tomorrow morning on Good Morning America: Tonya Reiman, author of The Body Language of Dating: Read His Signals, Send Your Own, and Get the Guy (Gallery, $24.99, 9781451624342). Tomorrow morning on the Today Show: Sally Bedell Smith, author of Elizabeth the Queen: The Life of a Modern Monarch (Random House, $30, 9781400067893). Tomorrow on NPR's Diane Rehm Show: Lori Andrews, author of I Know Who You Are and I Saw What You Did: Social Networks and the Death of Privacy (Free Press, $26, 9781451650518). Tomorrow on NPR's Tell Me More: Paul M. Barrett, author of Glock: The Rise of America's Gun (Crown, $26, 9780307719935). Tomorrow on the Ellen DeGeneres Show: Bethenny Frankel, author of A Place of Yes: 10 Rules for Getting Everything You Want Out of Life (Touchstone, $16, 9781439186916). Tomorrow night on the Colbert Report: Bill Moyers, who wrote the foreword to Jeffrey D. Clements' new book, Corporations Are Not People: Why They Have More Rights Than You Do and What You Can Do About It (Berrett-Koehler Publishers, $17.95, 9781609941055). Wired featured a behind-the-scenes peek at the creation of the opening title sequence in David Fincher's adaptation of The Girl with the Dragon Tattoo, which "includes mesmerizing details from all three of Stieg Larsson's books about hacker heroine Lisbeth Salander, not just the one upon which the movie is based." Blur Studio created the opening to Fincher's mandate, which was "to make the two-and-a-half-minute sequence a conceptual re-creation of Larsson's full Millennium trilogy--and to completely turn the idea of title sequences on its head," Wired wrote. "I got a call from him, it was the middle of the night in Sweden and he was on some shoot that was going really bad," Tim Miller, Blur's co-founder. "And he calls me and he says, 'Look, you're going to do this thing and it's going to redefine titles for our generation the way Se7en did and that’s all there is to it.' "
Marilyn Nelson was named the 2012 recipient of the Poetry Society of America's highest honor, the Robert Frost Medal, presented annually for "distinguished lifetime achievement in poetry." Previous winners have included Wallace Stevens, Gwendolyn Brooks, Allen Ginsberg, Marianne Moore and last year's honoree, Charles Simic. Nelson is is the author or translator of 14 books, including The Homeplace and The Fields of Praise: New and Selected Poems, both of which were finalists for the National Book Award. Among her many children's books is Carver: A Life in Poems, which received the Flora Stieglitz Straus Award and the Boston Globe/Horn Book Award. It was also a National Book Award finalist, a Newbery Honor Book and a Coretta Scott King Honor Book. The Demi-Monde: Winter by Rod Rees (Morrow, $26.99, 9780062070340). "Like a literary love child of Neal Stephenson and Tad Williams, The Demi-Monde: Winter, the first in a proposed quartet, is a dark, dangerous adventure tale set in a vaguely steampunk virtual world populated by the avatars of some of history's most villainous characters. Eighteen-year-old Ella is thrust into a world unlike any she has ever known when she is hired to retrieve the president's daughter from a virtual environment that was originally created to train combat soldiers in guerrilla warfare. A page-turner and a highly entertaining opening to a very promising series." --Billie Bloebaum, Powell's Books at PDX, Portland, Ore.
Walt Disney's Donald Duck: Lost in the Andes (The Complete Carl Barks Disney Library) by Carl Barks (Fantagraphics, $24.99, 9781606994740). "In Carl Barks' Duckburg we see all the human frailties: Donald Duck's anger, Scrooge's ambition, the Beagle Boys' greed. Barks was a virtuoso artist and writer who combined breakneck action with detailed and subtle art. You will find a master at his peak in Lost in the Andes, and your inner-child will thank you." --Eric Schultheis, Books Inc., Berkeley, Calif. The Gilder by Kathryn Kay (Kensington, $15, 9780758263223). "This is the story of a woman whose talents include the restoration and gilding of older works of art. Gilding becomes a metaphor for her inability to face the truths of her past, and she must remind herself that the process is not successful without repairing the foundation upon which the gold leaf is layered. In a tale filled with betrayal and repentance, missed opportunities and new beginnings, the layers of gold are transformed from denial of the past to real love in the present." --Fran Wilson, Colorado State University Bookstore, Fort Collins, Colo.
Bluefish by Pat Schmatz (Candlewick, $15.99, 9780763653347). "I loved this story about unlikely friends, each lonely and trapped by labels--trailer trash, brainy dork, and bluefish. I cared deeply about these characters, who are struggling not to be defined by their past expectations, and I cheered for their unconventional teacher who provoked them into seeing their future possibilities. A great book for fans of Katherine Hannigan and Gary Schmidt." --Ellen Davis, Dragonwings Bookstore, Waupaca, Wis. In September 2008, historian Tony Judt was stricken with ALS, a disease that would take his life within two years. Four months after that terrible diagnosis, though, he began Thinking the Twentieth Century, an unusual collaboration with Timothy Snyder--an expansive, challenging series of dialogues in which the two trace the major currents in the intellectual history of 20th-century Europe. 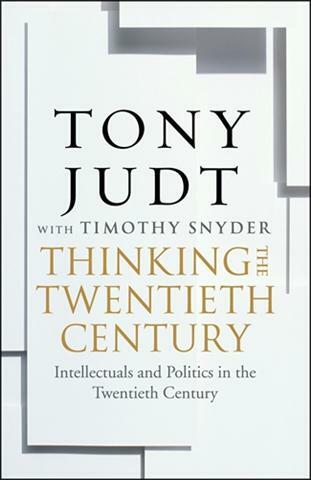 Judt and Snyder, a Yale professor specializing in Eastern European history, draw on rich stores of reading and reflection to explore the ideological clashes that marked the last century, most notably the rise and fall of communism and fascism and the apparent triumph of democratic capitalism (the world according to John Maynard Keynes), even as its foundations were subsequently shaken in the face of the global economic crisis. These conflicts, in Judt's view, all involved the question of how societies wished to govern themselves and "implicit or explicit debates over the rise of the state," a tension played out in American politics (if in a somewhat desiccated form) in the debate over taxation and government spending. "What is lost here," he laments, "what is corroded in the distaste for common taxation, is the very idea of society as a terrain of shared responsibilities." There are moments when one's attention may wander at the mention of some unfamiliar Eastern European economic or political thinker, but this is a true conversation, not an arid academic colloquy. Judt and Snyder never lose sight of the grand sweep of events and personalities marking an era that "began with a catastrophic world war and ended in the collapse of most of the belief systems of the age." In the end, they bring to bear the lessons of history in what Judt, a fervent social democrat, frames as nothing less than a choice between "the politics of social cohesion based around collective purposes versus the erosion of society by the politics of fear." Shelf Talker: Two brilliant minds in a capacious dialogue about 20th-century European intellectual history.